DNA binding protein A (DbpA) is a member of the human cold shock domain–containing protein superfamily, with known functions in cell proliferation, differentiation, and stress responses. DbpA mediates tight junction–associated activities in tubular epithelial cells, but the function of DbpA in mesangial cells is unknown. Here, we found DbpA protein expression restricted to vascular smooth muscle cells in healthy human kidney tissue but profound induction of DbpA protein expression within the glomerular mesangial compartment in mesangioproliferative nephritis. In vitro, depletion or overexpression of DbpA using lentiviral constructs led to inhibition or promotion, respectively, of mesangial cell proliferation. Because platelet–derived growth factor B (PDGF-B) signaling has a pivotal role in mesangial cell proliferation, we examined the regulatory effect of PDGF-B on DbpA. In vitro studies of human and rat mesangial cells confirmed a stimulatory effect of PDGF-B on DbpA transcript numbers and protein levels. Additional in vivo investigations showed DbpA upregulation in experimental rat anti–Thy1.1 nephritis and murine mesangioproliferative nephritis models. To interfere with PDGF-B signaling, we injected nephritic rats with PDGF-B neutralizing aptamers or the MEK/ERK inhibitor U0126. Both interventions markedly decreased DbpA protein expression. Conversely, continuous PDGF-B infusion in healthy rats induced DbpA expression predominantly within the mesangial compartment. Taken together, these results indicate that DbpA is a novel target of PDGF-B signaling and a key mediator of mesangial cell proliferation. DNA binding protein A (DbpA) belongs to the cold shock protein family, with known functions in cell proliferation, differentiation, cell-cell communication, and stress responses.2 Recently, DbpA was shown to play a crucial role in the differentiation and proliferation of proximal tubular cells.3 DbpA was first identified as a transcription factor binding to a responsive element within the epidermal growth factor receptor promoter.4 It contains an ancestral cold shock domain that is conserved from bacteria to humans. Cold shock proteins bind RNA as well as DNA.5 By virtue of these activities, DbpA may alter gene transcription as well as affect mRNA translation.6,7 DbpA is mainly expressed in smooth muscle cells of the heart, vasculature, and skeletal muscle, whereas DbpB/Y–box binding protein-1 (YB-1) is ubiquitously expressed, and DbpC restricted to germinal cells in the testis.2,8 Upregulated DbpA expression has been observed in various cancers.9–14 DbpA is involved in cell proliferation by regulating target genes, including thymidine kinase, cyclin D1, and proliferating cell nuclear antigen (PCNA).15,16 In accord with its promitogenic effects, DbpA represses cellular differentiation.3,17,18 Given its interaction with a major tight junction (TJ) protein, Zonula Occludens 1 (ZO-1), DbpA is also denoted ZO-1–associated Nuclear Acid Binding protein (ZONAB).3,19 In tubular epithelial cells, DbpA mediates TJ-associated activities by shuttling to the nucleus.20–23 However, little is known about the role of DbpA in mesangial cells. Platelet–derived growth factor B (PDGF-B) is an essential stimulus that activates mesangial cell proliferation in MsPGN.24,25 One effect of PDGF-B signaling is the induction of cold shock protein YB-1/DbpB.26 Considering the structural and functional similarities between DbpA and DbpB/YB-1, we hypothesized that DbpA may also contribute to the PDGF-B effects in mesangioproliferative diseases. Immunohistochemistry was performed on human kidney biopsies from patients exhibiting a proliferative mesangial cell response and excess extracellular matrix. In controls (not shown) and minimal change disease, DbpA was detected in vascular smooth muscle and in minute amounts in few tubulointerstitial and periglomerular cells. A strong induction of DbpA protein expression became apparent in glomeruli as well as tubulointerstitial infiltrates diagnosed with IgA and lupus ISN/RPS class 4 G(A) GN (Figure 1A, a–i). The localization of DbpA protein was mostly confined to the mesangial compartment, emphasizing the lobular architecture. 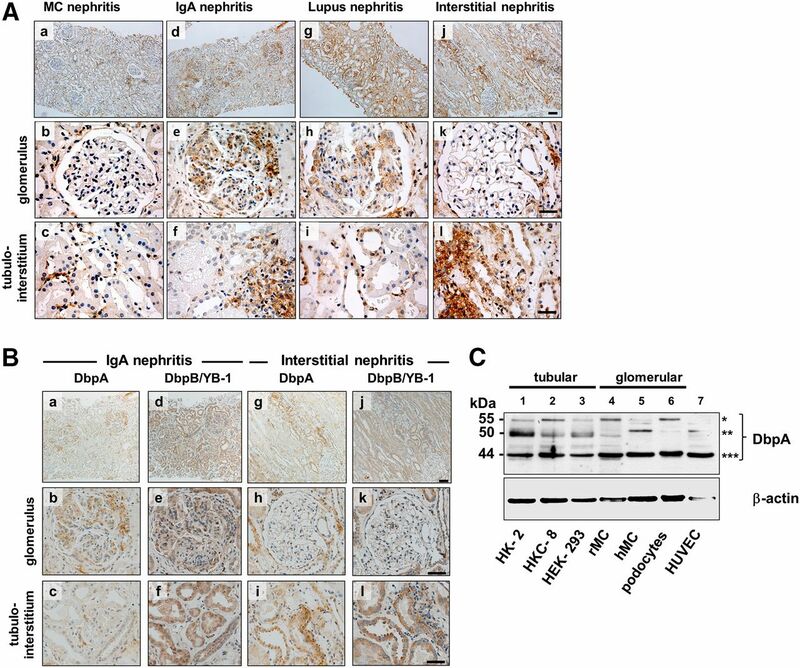 In biopsies diagnosed with interstitial nephritis, DbpA expression was not upregulated in glomerular cells; however, tubular and infiltrating inflammatory cells were prominently immunopositive (Figure 1A, j–l). Expression of DbpA in human kidney disease and cell lines. (A) Immunohistochemistry shows that DbpA expression is not detected in glomerular cells in minimal change (MC) GN, however DbpA expression is interspersed in tubulointerstitial cells (a–c). In contrast, DbpA protein was detected within the mesangial compartment of the glomeruli from patients with IgA nephritis and in cell infiltrates of the interstitium (d–f). A similar pattern of glomerular expression was observed in patients with lupus ISN/RPS class 4 G(A) GN with upregulated DbpA expression in tubular cells (g–i). The most profound tubular cell and interstitial upregulation of DbpA was seen with interstitial nephritis, where glomerular cells were immune negative (g–l). Images were made with a Leica DM6000 B Microscope (Leica Microsystems) using either a 100× (a, d, g, and j) or a 400× objective (b, c, e, f, h, i, k, and l). Scale bars, 200 μm in a, d, g, and j; 50 μm in b, c, e, f, h, i, k, and l. (B) Immunohistochemistry for DbpA and DbpB/YB-1 in sequential tissue slices from a patient with IgA nephritis reveals concordant upregulation of both proteins in mesangial compartment; at the same time, the staining pattern in the tubular cells and tubulointerstitial infiltrate markedly differs. (C) Western blot analysis of DbpA protein expression in cell lysates of human proximal tubular epithelial cells HK-2 and HKC-8, rMCs, human primary mesangial cells (hMCs), human embryonic kidney cells (HEK-293s), human podocytes, and human umbilical vein endothelial cells (HUVECs). Three major bands are shown: *55 kD; **50 kD; ***44 kD. To compare the expression of both cold shock proteins DbpA and DbpB/YB-1 in MsPGN, consecutive sections were stained (Figure 1B). In IgA nephritis biopsies, the mesangial staining pattern was similar for both cold shock proteins, whereas the interstitial and periglomerular inflammatory cells stain more positive for DbpA than for DbpB/YB-1. However, DbpB/YB-1 showed a much stronger upregulation in tubular cells, which was not seen for DbpA. These observations provided the first clue that DbpA may be involved in the proliferative response of mesangial cells. In the interstitial nephritis biopsies, no staining was observed within the glomeruli. However, YB-1 again showed a strong upregulation in the tubuli, a pattern that only marginally overlapped with that of DbpA (Figure 1B). To determine the expression pattern of DbpA isoforms, we first analyzed immortalized and primary kidney cell cultures from rat as well as human origin. Immunoblotting was performed using a polyclonal peptide–derived, affinity–purified antibody detecting a unique epitope within the N-terminal domain of DbpA (Supplemental Figure 1). Three distinct bands corresponding to the relative molecular masses of 44, 50, and 55 kD were detected (Figure 1C). The 44-kD isoform was uniformly expressed in all cells, whereas the 50- and 55-kD bands markedly differed in intensity. Two isoforms of DbpA have been described, raising the question as to the source of third band.2,27 This band may represent a partially cleaved or proteolytically processed DbpA fragment, or alternatively, it may correspond to another undescribed alternatively spliced variant (Supplemental Figure 2). Given the profound change in DbpA protein expression observed in MsPGN, we used lentiviral constructs to perform both overexpression and knockdown interventions in rat mesangial cell (rMC) to identify the function(s) of DbpA (Figures 2 and 3). Knockdown of DbpA resulted in lower cell confluence (Figure 2A), whereas overexpression induced cell proliferation (Figure 3A). DbpA protein expression and localization were analyzed by both Western blotting and immunofluorescence (Figures 2, B and C and 3, B and C). 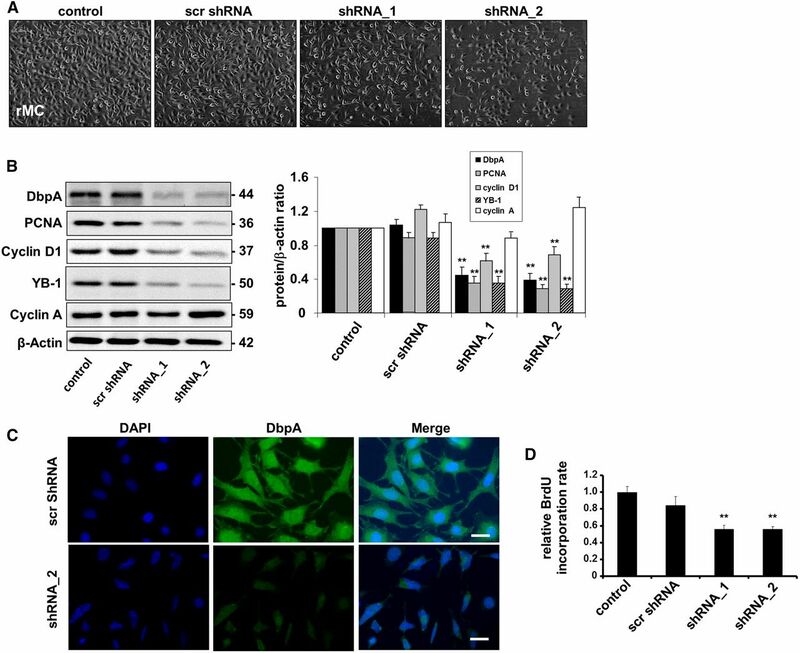 Western blot analysis revealed a profound reduction in DbpA (44 kD) protein expression by specific shRNAs. Overexpression of the DbpA isoforms resulted in additional bands of 55 kD (DbpA_a) and 40 kD (DbpA_b) (Figure 3B). DbpA expression closely correlated with cell proliferative gene synthesis (e.g., PCNA and cyclin D1) (Figures 2B and 3B), which was previously reported to be regulated by DbpA. DNA synthesis was quantified by bromodeoxyuridine (BrdU) incorporation (Figures 2D and 3D), confirming this observation. Furthermore, in a rescue experiment with DbpA overexpression in rMC with a stable knockdown of endogenous DbpA, an even more pronounced induction of cell proliferation was apparent, confirming the promitogenic effects of both isoforms (1.77±0.09- and 1.55±0.01-fold upregulation, respectively) (Figure 3E). Thus, DbpA is a necessary and potent promitogenic factor for mesangial cells. DbpA knockdown leads to decreased cell proliferation. (A) Cellular morphology of rMCs after knockdown of DbpA for 3 days using two different shRNA oligos. (B) Western blot analysis confirms successful DbpA knockdown of transcripts by shRNA, which is accompanied by a significant reduction in the expression of cell proliferation markers (e.g., PCNA and cyclin D1) but not cyclin A. **P<0.01 (n=3). (C) Immunofluorescence staining observes both cytoplasm and nuclear expression of DbpA, but lower expression of DbpA protein in shRNA-incubated cells. Scale bar, 50 μm. (D) BrdU cell proliferation assay shows a marked decrease of cell proliferation in DbpA shRNA cells compared with the scrambled shRNA control. **P<0.01 (n=3). Overexpression of DbpA in rMCs leads to increased cell proliferation. (A) Cellular morphology of rMCs after overexpression of DbpA isoforms DbpA_a and DbpA_b for 3 days. Both interventions result in increased cells proliferation. (B) Western blot analysis reveals the overexpression of both isoforms of DbpA (40 and 55 kD; asterisks in left panel) by pCDH lentiviral transduction, which is accompanied by upregulation of cell proliferation markers (e.g., PCNA and cyclin D1). *P<0.05 (n=4). (C) Immunofluorescence staining shows both cytoplasmic and nuclear DbpA expression, whereas overexpressed DbpA protein mainly localizes in a punctuate manner within the cytoplasm. Scale bar, 50 μm. (D) BrdU cell proliferation assay shows increased cell proliferation in DbpA_a and DbpA_b overexpressing mesangial cells compared with transfection of control vector. **P<0.01 (n=3). (E) Overexpression of DbpA in rMCs with stable knockdown of DbpA leads to much stronger induction of BrdU incorporation. **P<0.01 (n=3). PDGF-B plays a pivotal role in the induction of MsPGN. To test whether PDGF-B induces DbpA expression, we cultured human mesangial cells in the presence of recombinant human PDGF-BB for up to 2 days. Cells were lysed, and the level of DbpA expression was compared (Figure 4A). The results indicated an increase in both the 44- and 55-kD forms of DbpA after 24 hours. Similar results were obtained with a dose-titration analysis in rMCs, which mainly express the 44-kD isoform (Figure 4B). Immunoblotting revealed a concentration-dependent upregulation of DbpA protein (Figure 4B). Repeating the time course with 50 ng/ml rat PDGF-BB yielded a significant induction of DbpA protein within 2 hours that lasted for >48 hours (maximum 2.2±0.21-fold) (Supplemental Figure 3). A similar situation was observed in primary human mesangial cells (not shown). In accordance with the upregulated protein expression, DbpA mRNA level was also elevated after 24 and 48 hours of PDGF-BB stimulation (Figure 4C). We further tested whether DbpA is a downstream target of PDGF-B signaling in mesangial cells in vitro. Immunofluorescence staining for endogenous DbpA protein showed that DbpA predominantly localized to the nucleus, which is not in accord with the staining pattern observed in tissue samples. However, nuclear DbpA staining has been reported for transformed cells.9 After PDGF-BB stimulation, DbpA staining intensity increased, and DbpA was observed within the cytoplasm, particularly in cells localized in regions of high cell density. Furthermore, mitotic cells showed the highest levels of DbpA (Figure 4D). Because DbpA expression is orchestrated by PDGF-B signaling, additional investigation focused on the functional relationships between DbpA and PDGF-B. Therefore, mesangial cells with different levels of DbpA expression were stimulated with recombinant PDGF-BB (Figure 4E). BrdU incorporation showed that PDGF stimulation had a mitogenic effect and promoted DNA synthesis. However, stimulation of DbpA overexpressing cells with PDGF led to higher proliferation rates compared with controls, indicating that DbpA’s promitogenic effects may require upstream initiators (e.g., PDGF-B signaling). Conversely, suppression of DbpA expression markedly reduced cell proliferation. The block in proliferation could not be overcome by the addition of PDGF, indicating that DbpA acts as an essential factor for cell division. DbpA protein expression is upregulated by PDGF-BB stimulation in mesangial cells in vitro. (A, upper panel) Western blot analysis of DbpA protein expression in PDGF-BB–challenged primary human mesangial cells (hMCs). *55 kD; **50 kD; ***44 kD. (A, lower panel) Quantification of band intensities reveals 2.5-fold induction of DbpA protein expression (44 and 55 kD) after 24 hour incubation with human PDGF-BB (50 ng/ml). *P<0.05 (n=3). (B, upper panel) Western blot analysis of DbpA protein expression in rMCs stimulated with rat PDGF-BB for 24 hours at increasing doses. A dose-dependent upregulation of DbpA is shown from 5 to 10 ng/ml PDGF-BB stimulation. No significant change of DbpA expression was observed after stimulation with 50–200 ng/ml PDGF-BB. *55 kD; **50 kD; ***44 kD. (B, lower panel) Two bands at 50 and 44 kD are seen, with the predominant band at 44 kD. ctrl, Control. **P<0.01 (n=3). (C) Real–time PCR analysis for DbpA transcripts in rMCs reveals a profound upregulation after 24 and 48 hours of PDGF-BB incubation. *P<0.05 (n=3). (D) Immunofluorescence staining for DbpA in rMCs. Compared with vehicle, DbpA expression increases after 24 hours of incubation with rPDGF-BB (50 ng/ml). DbpA protein accumulates mainly within the cytoplasm. Scale bar, 50 μm. (E) Changes of BrdU incorporation rates are determined for rMCs undergoing overexpression of DbpA_a and DbpA_b or knockdown of DbpA. Stimulation with rPDGF-BB (50 ng/ml) was performed for 24 hours. *P<0.05 (n=3). To assess the expression of DbpA in vivo, we used the anti–Thy1.1 nephritis model, an antibody–induced, complement–mediated rat model that recapitulates many features of mesangioproliferative glomerular diseases in humans. In healthy rat kidneys, DbpA protein expression was not detected in glomerular cells (Figure 5A). Smooth muscle cells within the blood vessels were immunopositive and thus, served as internal controls. After the initiation of anti-Thy1.1 nephritis, a marked induction of DbpA protein expression was seen within the mesangial compartment of tissue samples collected after 4 hours and at 4, 7, and 21 days after antibody application. Cytoplasmic DbpA protein abundance coincided with mesangial cell activation/proliferation, which peaked at day 7 and returned to background levels after 3 weeks during disease resolution (Figure 5A). DbpA protein expression is induced in experimental models of anti-Thy1.1 and mice MsPGN. (A) DbpA protein was identified by immunohistochemistry in kidney tissue from healthy rats (a and b) and the time course of anti-Thy1.1 nephritis (c and d, 4 hours; e and f, day 4; g and h, day 7; and i and j, day 21). 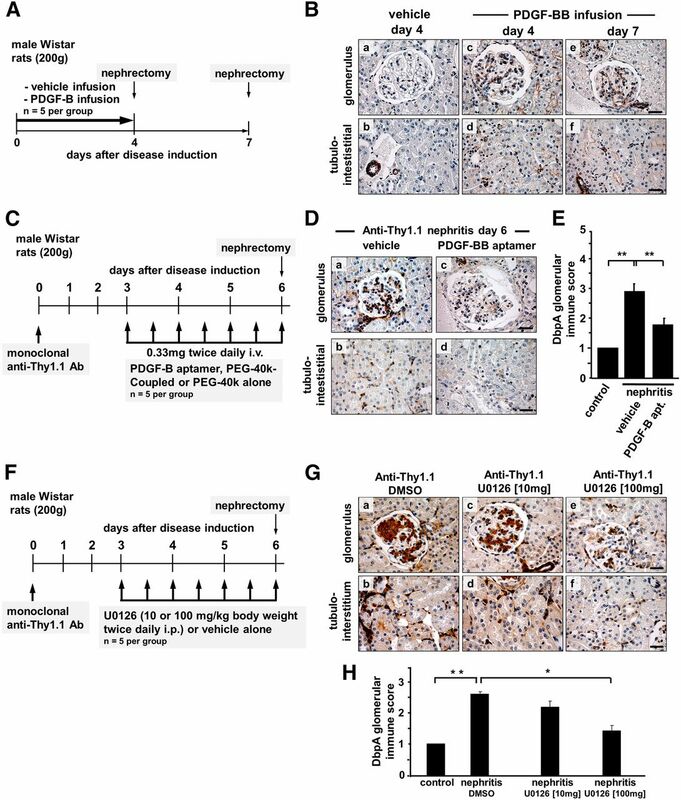 Whereas no DbpA was detected in the glomeruli of healthy rats, significant DbpA expression was observed within the cytoplasm of mesangial cells after the induction of anti-Thy1.1 nephritis on day 4, peaking at day 7 and returning to background after 3 weeks. Magnification, ×100 in a, c, e, g, and i; ×400 in b, d, f, h, and j. Scale bars, 100 μm in a, c, e, g, and i; 25 μm in b, d, f, h and j. (B) Western blot analysis reveals profound upregulation of DbpA protein (44 kD) expression that peaks at day 7 and subsequently, returns to basal levels. DbpA protein levels normalized to β-actin are shown. **P<0.01; ***44 kD. (C) DbpA protein expression by immunohistochemistry staining in kidney tissue from healthy mice (a and b) and after induction of MsPGN for 3 (c and d) and 6 (e and f) days. Quantification of the DbpA staining is shown for 50 visual fields. **P<0.01. Glomerular tissue lysates were prepared after sieving of cortical rat tissue that was disintegrated and digested with collagenase. Immunoblotting of glomerular proteins revealed that, in the course of anti-Thy1.1 nephritis, a marked fourfold induction of DbpA protein occurred, which peaked at day 7 and subsequently, returned to basal levels 2 weeks after disease induction (Figure 5B), a trend similar to that seen by immunohistochemistry. In addition, the relative molecular mass of DbpA was approximately 44 kD, which corresponds to the predominant isoform seen rMC cultures. Similar expression patterns of DbpA were also evidenced in a mouse model of MsPGN (Figure 5C) induced by administration of an antimesangial cell serum in combination with LPS.28 DbpA was detected in afferent and efferent glomerular vessels in healthy control kidney tissue. However, it was strongly upregulated within the mesangial compartment 3 and 6 days after disease induction. For mesangioproliferative glomerular diseases, a central role for PDGF-B in orchestrating the proliferative response has been well established. A strong induction of PDGF-B expression in the anti–Thy1.1 nephritis model has been described.25 To address the question of whether PDGF-B induces DbpA expression in MsPGN, healthy animals were continuously infused with PDGF-BB (40 μg/d versus vehicle alone). Using immunohistochemistry, a marked cytoplasmic expression of DbpA within the mesangial compartment of glomeruli was apparent in the animals receiving PDGF-BB at both 4 and 7 days. For vehicle-infused animals, no DbpA-positive staining was observed (Figure 6, A and B). Renal expression of DbpA after in vivo infusion of PDGF-BB. (A) Immunohistochemistry for DbpA was performed with renal biopsies from rats that were infused with vehicle for 7 days (control) or PDGF-BB for 4 or 7 days. (B) Whereas control rats express no DbpA in the glomeruli, the induction of DbpA is apparent within the mesangium of PDGF-BB–infused rats on both day 4 and day 7. In vivo treatment of anti–Thy1.1 nephritis rats with PDGF-B–specific aptamers leads to decreased DbpA upregulation. (C) After the induction of anti-Thy1.1 nephritis, animals received twice daily injections of PDGF-B aptamers or vehicle alone from day 3 to day 6 (schematically depicted). (D) Immunohistochemistry staining for DbpA reveals a remarkably decreased expression of DbpA in PDGF-B aptamer–treated rats (b and d) compared with vehicle-treated controls (a and c). Representative results are shown. Scale bars, 25 μm. (E) Quantification of the immune score of DbpA protein results in a significant decrease in anti-Thy1.1 nephritis treated with aptamers versus vehicle (P<0.01; n=5). In vivo treatment of anti–Thy1.1 nephritis rats with MEK inhibitor U0126 leads to decreased DbpA upregulation. **P<0.01. (F) After the induction of anti-Thy1.1 nephritis, animals received twice daily injections of U0126 (10 or 100 mg/kg) or vehicle alone from day 3 to day 6 (schematically depicted). (G) Immunohistochemistry staining for DbpA reveals a decreased expression of DbpA in U0126-treated rats (c–f) compared with vehicle-treated controls (a and b). Representative images are shown. Scale bars, 25 μm. (H) Quantification of the immune score of DbpA protein results in a significant decrease in anti-Thy1.1 nephritis treated with 100 mg/kg U0126 versus vehicle. *P<0.05 (n=5 for each group); **P<0.01 (n=5 for each group). To corroborate PDGF-B as an inducer of DbpA expression in vivo, we performed a blockade of extracellular PDGF-B activities via application of specific aptamers in diseased animals. Anti-Thy1.1 nephritis was induced, and the rats subsequently received twice daily injections of specific PDGF-B aptamer (0.33 mg PDGF-B aptamer versus vehicle alone) from day 3 to day 6 (Figure 6C) as previously described.26 Application of PDGF-B aptamers inhibited DbpA protein expression in glomerular and tubulointerstitial cells compared with in vehicle–infused diseased animals (Figure 6, D and E). Taken together, this indicates that DbpA is both a downstream target of PDGF-B and a potential mediator of PDGF-B–dependent mesangial cell proliferation in vivo. The mitogen–activated protein kinase (MAPK)/extracellular signal–regulated kinase (ERK) pathway seems to be of fundamental importance for mesangial cell activation and proliferation. PDGF-B activates ERK signaling. To test the hypothesis that ERK signaling is involved in the cellular response that coordinates DbpA expression, we applied a synthetic mitogen–activated protein kinase/extracellular signal–regulated kinase kinase (MEK) inhibitor U0126. Anti-Thy1.1 nephritis was induced, and rats subsequently received twice daily injections of U0126 (10 or 100 mg/kg versus vehicle alone) from day 3 to day 6 (Figure 6F). We observed a markedly lower cellular DbpA content by immunohistochemistry with 10 mg/kg U0126. Almost no DbpA staining was observed after application of 100 mg/kg U0126 (Figure 6, G and H). This is the first report showing increased DbpA expression in mesangioproliferative glomerular disease in humans, mice, and rats. We identify DbpA as a key regulator of mesangial cell proliferation, which acts downstream of PDGF-B–dependent signaling. PDGF-B upregulates both DbpA protein expression and transcript numbers. DbpA protein expression closely correlated with the mesangioproliferative response and phases of the disease. Mesangial cell proliferation is the key pathologic feature in mesangioproliferative diseases. A promitogenic role of DbpA has been reported in several malignant diseases. Enhanced DbpA expression is associated with advanced stages of hepatocellular carcinoma, and nuclear translocation of DbpA indicates a poor prognosis.9 However, DbpA–dependent cell proliferation is not only observed in cancer. Recent studies show that DbpA is crucial for tubular cell proliferation in the kidney.3 Several regulatory mechanisms may be involved. DbpA is directly regulated by proliferation–associated transcription factors (e.g., c-myc31 and E2F110). Avian myelocytomatosis viral oncogene homolog is one of the best studied oncogenes, whereas E2F1 has been shown to be important for cell proliferation, particularly the transition of cells from G1 to S phase.41,42 DbpA also interacts with guanine nucleotide exchange factor and may, thereby, mediate Rho–regulated G1 to S transition in the cell cycle.43 By acting as a transcription factor, DbpA can directly bind to the promoter region of several proliferation–associated genes, including the epidermal growth factor receptor,4 thymidine kinase,15 cyclin D1, and PCNA.16 Thus, it may enhance target gene expression and promote cell proliferation. However, DbpA directly interacts with Cdk4 and inhibits the formation of Cdk4/cyclin D1 complexes that block the G1/S transition in the cell cycle.8 DbpA transcriptionally upregulates cyclin D1 expression but interestingly, inhibits cyclin D1 activity via its binding to Cdk4. This may indicate the existence of a DbpA–mediated autoregulatory loop that controls cell proliferation, because we observed that dividing cells appear to express more DbpA. Recent experimental evidence suggests a pathophysiologic role of endoplasmic reticulum (ER) stress in MsPGN.52 When mammalian cells were subjected to stress that targets the ER, cells activated a defense mechanism known as the unfolded protein response, which is evolutionarily conserved from yeast to humans.53 The major regulator of the unfolded protein response is the ER chaperone, glucose–regulated protein 78 (grp78)/BiP54; grp78 not only binds to unfolded proteins but also, regulates the activation of ER stress signal transducers that protect stressed cells from apoptosis.55 After induction of anti-Thy1.1 nephritis, the expression of grp78 protein in mesangial cells is markedly increased.52 DbpA has been identified as a transcriptional regulator that directly binds to the core promoter region of the grp78 gene at the stress–inducible change region.56 This assigns DbpA a role in the stress response of mesangial cells in MsPGN. Our findings extend a previous study showing that DbpB/YB-1 is a specific and necessary mediator of PDGF-B signaling in MsPGN.26 DbpA and DbpB/YB-1 share similar expression patterns in the mesangial compartment of IgA nephritis but different expression patterns in interstitial nephritis. DbpB/YB-1 is expressed in healthy kidney, whereas DbpA is not. This may indicate a tissue-specific and etiologic-dependent regulation of DbpA and DbpB/YB-1 expression, which may be partly explained by a feedback loop between DbpA and DbpB/YB-1. We previously reported not only an increased expression of DbpB/YB-1 protein but also, a subcellular shuttling from the nucleus to the cytoplasm regulated by PDGF-B. This indicated that DbpB/YB-1 predominantly acts as a regulator of translational processes by stabilizing mRNA in this stage of the disease57,58 or activating/suppressing target mRNA translation.59–62 Similar mechanisms may also apply to DbpA. First, DbpA and DbpB/YB-1 share 100% homology in the cold shock domain, which contains RNA binding motifs.63,64 Second, phosphorylation of DbpB/YB-1 at Ser102 by the MAPK/ERK or AKT pathways activates mRNA translation.62,65 Phosphorylation of DbpA at Ser134, homologous to Ser102 in YB-1, has also been identified as a downstream target of the MAPK/ERK pathway14 that may indicate similar roles for DbpA and DbpB/YB-1 in mesangioproliferative disease. rMCs were grown in RPMI 1640 medium (Gibco, Carlsbad, CA) supplemented with 10% FBS, 100 U/ml penicillin, and 100 μg/ml streptomycin at 37°C in humidified atmosphere containing 5% CO2. Primary human mesangial cells (CC-2559; Lonza Group Ltd) were grown in a Clonetics MsGM Culture System (CC-3146; Lonza Group Ltd) containing mesangial cell basal medium supplemented with 5% FBS and GA-1000 at 37°C in humidified 5% CO2 in air. Human embryonic kidney cell, human proximal tubular epithelial cell lines (HK-2 and HKC-8), human podocytes, and human umbilical vein endothelial cells were grown in DMEM/F12 medium supplemented with 10% FBS, 100 U/ml penicillin, and 100 μg/ml streptomycin at 37°C in humidified atmosphere with 5% CO2. The study protocol involving human samples was approved by the local ethics committee, and patients provided informed written consent in agreement with the Declaration of Helsinki. Human kidney biopsy samples diagnosed with minimal change disease (n=5), IgA nephropathy (n=8), lupus nephritis type 4 (n=5), and interstitial nephritis (n=5) were stained for DbpA expression and compared with control kidney tissue sampled from patients undergoing nephrectomy because of renal cell carcinoma. Serial sections from IgA nephritis and interstitial nephritis were also stained for YB-1/DbpB expression. In the latter cases, macroscopically unaffected tissue was embedded and analyzed. Unilateral ureter obstruction was performed on 14 C57BL6/N mice (20–30 g; 12–14 weeks old; Janvier) and 13 mouse Y–box protein 4−/− mice (Division of Oncology, Washington University School of Medicine, St. Louis, MO). Mice underwent anesthesia by intraperitoneal injection of 2% Rompun (Xylazine; Bayer HealthCare, Whippany, NJ) and Ketanest (Ketamine hydrochloride; Pfizer) at 100 μl/20 g, and the procedure was performed under aseptic conditions. After incision into the left abdomen, the ureter was tied below the kidney with 4-0 nylon. The incision was sutured, and mice were caged individually. Control and treated animals were euthanized 5 and 14 days after disease induction. Kidney tissue was collected, and protein extracts were prepared. For immunohistochemistry, tissue fixation was performed in Methacarn solution and embedded in paraffin. In vivo infusion of PDGF-BB was performed as described.68 Briefly, five healthy male Wistar rats (200 g; Charles River Laboratories) received a 7-day intravenous infusion of 40 μg/d PDGF-BB, and five rats received vehicle infusion only. Infusion was performed continuously through a catheter in the left internal jugular vein with micro-osmotic pumps. Renal biopsies were obtained from each rat at day 4 and day 7. Anti-Thy1.1 MsPGN was induced in male Wistar rats as described above. Starting on day 3 after the onset of disease, rats received two intravenous injections of 0.33 mg PDGF-B–specific aptamers or control vehicle every day as described.26,69 Necropsies were performed in all rats at day 6. Anti-Thy1.1 MsPGN was induced in male Wistar rats as described above. Rats received twice a day intraperitoneal injections of 10 or 100 mg/kg U0126 (Cell Signaling Technology, Danvers, MA) dissolved in DMSO or control vehicle starting at day 3 after the induction of anti-Thy1.1 MsPGN.26,69 Necropsies were performed in all rats at day 6. The animals received the last dose of U0126 1 hour before being euthanized. Methacarn–fixed, paraffin–embedded tissue sections were used for immunohistochemistry.26 Four-micrometer sections of tissue samples were deparaffinized in xylene and rehydrated in graded ethanol. Endogenous peroxidase was blocked by incubation in 3% hydrogen peroxide. The sections were incubated for 1 hour at room temperature with the primary antibody diluted in PBS plus 1% BSA (Sigma-Aldrich, St. Louis, MO). After washing in PBS, the sections were incubated with peroxidase–labeled secondary antibody (Dako, Glostrup, Denmark) for 1 hour at room temperature. Sections were developed with diaminobenzidine for 5 minutes. For formalin– or zinc–fixed, paraffin–embedded tissue sections, an additional antigen retrieval step by heating in a microwave with 10 mM sodium citrate buffer (pH 6.0) was included after rehydration.70 Normal rabbit IgG served as negative control (Dako). Images were captured on a light microscope (Leica Microsystems, Buffalo Grove, IL). Rat kidneys were fixed in methacarn solution, embedded in paraffin, sectioned at 3 μm, stained with anti-DbpA, and developed with diaminobenzidine. The immune score of DbpA of each glomeruli was scored on a scale of one to five according to the intensity of the staining: 1, normal control; 2, mild; 3, medium; 4, strong; and 5, very strong. The total score is the calculated average of three sections with approximately 140 glomeruli per section. rMCs were seeded 150,000 cells per well in six-well plates and grown with RPMI 1640 medium supplemented with 10% FCS, 1% l-glutamine, 100 U/ml penicillin, and 100 μg/ml streptomycin. Primary human mesangial cells were seeded at 300,000 cells per well in six-well plates and grown in the Clonetics MsGM Culture System. Before stimulation, cells were growth arrested with serum–free MCDB medium (Sigma-Aldrich) for 24 hours. Rat PDGF-BB and human PDGF-BB were added to rat and human mesangial cells, respectively. DbpA overexpression plasmids (pDream vector) were from GeneScript (Piscataway, NJ). The coding sequences were further subcloned into the pCDH-EF1 lentivirus expression vector. For knockdown, DbpA shRNA and scribble shRNA, vectors were used from Sigma-Aldrich (DbpA shRNA-1: CCGGGATGGAGAAACTGTAGAGTTTCTCGAGAAACTCTACAGTTTCTCCATCTTTTTG; DbpA shRNA-2: CCGGGTTCAACGTCAGAAATGGATACTCGAGTATCCATTTCTGACGTTGAACTTTTTG). Human embryonic kidney cells were plated out in a six-well dish and cotransfected with 2 μg DbpA constructs plasmid, 1 μg psPAX2, and 1 μg pVSV-G after growing to 70% confluence. The transfection was performed with metafectene and optimem in antibiotic-free medium. After 1 day, medium was exchanged with normal culture medium, which contained the produced virus, and cultured for another 24 hours. Virus-containing supernatant was harvested and filtered with a 0.2-μm sterile filter, 4 μg/ml polybrene was added, and the target cells (rMCs) were infected. After 6 hours of transduction, the same volume of fresh medium was added, and the medium was exchanged to fresh medium the following day. Target cells were harvested 3 days after the transduction for additional analysis. Stably transduced cell lines were selected by incubating with puromycin (2 μg/ml) for 7 days. Proliferation of cells with DbpA overexpression and knockdown was quantified by BrdU incorporation using the BrdU Colorimetric ELISA Kit (Roche, Basel, Switzerland). Cells were plated on 96-well plates and growth arrested with medium without FCS for 24 hours followed by incubation with PDGF-B for 24 hours. During the last 16 hours, cells were grown in the presence of BrdU, and the incorporation thereof was measured by ELISA using an anti-BrdU mAb. Cell or tissue protein extracts were prepared and separated by SDS-PAGE (4%–12% Bis-Tris or 8% Tris-glycine gels; NuPAGE; Life Technologies, Carlsbad, CA) and transferred onto nitrocellulose membranes (Thermo Fisher Scientific, Vernon Hills, IL). Nonspecific binding was blocked with 5% milk in TBS-Tween before adding primary antibodies. Horseradish peroxidase–conjugated anti–rabbit or anti–mouse secondary antibodies (Santa Cruz Biotechnology, Santa Cruz, CA) were used for detection. The membrane was developed with SuperSignal Ultra Reagent (Thermo Fisher Scientific) according to the manufacturer’s instructions. Total RNA was isolated using the Invisorb Spin Cell-RNA Mini Kit (Invitek, Berlin, Germany). First–strand cDNA synthesis was performed using 1 μg total RNA from each sample, 500 μM dNTP, 250 ng random primer, 30 U RNAsin, and 200 U maloney murine leukemia virus reverse transcription in a 30-μl reaction volume. Real-time PCR was carried out using an ABI Prism 7700 Sequence Detector (Applied Biosystems, Foster City, CA), TaqMan Universal PCR Master Mix, and gene expression assay for DbpA (Rn00519737_m1); 18S ribosomal RNA (Hs99999901_s1) served as internal control (Life Technologies). Rat and human PDGF-BB were obtained from Sigma-Aldrich. An affinity–purified polyclonal DbpA antibody was raised in rabbits against a unique peptide-epitope located within the N-terminal domain of DbpA (Eurogentech, Cologne, Germany) (Supplemental Figure 1). Rabbit anti–mouse Y–box protein 4 was generously provided by Tim Ley.71 The following commercial antibodies were used for Western blot and immunohistochemistry staining: PCNA (Santa Cruz Biotechnology), cyclin A (Santa Cruz Biotechnology), cyclin D1 (Zytomed), and β-actin (Sigma-Aldrich). All values are expressed as the means±SDs. Statistical analysis was performed using GraphPad Prism 6.0 (GraphPad Software Inc., San Diego, CA). Statistical significance was evaluated using a one-way ANOVA followed by a post hoc Bonferroni test. P.R.M. is cofounder of antibodies-online and medixmind. The authors thank Antonia Bock and Dr. Josephine Hildebrandt for technical assistance. We are grateful to Timothy J. Ley (Washington University in St. Louis, St. Louis, MO) for providing his mouse Y–box protein 4 (MSY4) sera and the MSY4 knockout mice. This work was supported by Deutsche Forschungsgemeinschaft SFB 854 Project A01, grants ME-1365/9-1 and ME-1365/7-2 (to P.R.M.) and LI-1031/4-1 (to J.A.L.). This article contains supplemental material online at http://jasn.asnjournals.org/lookup/suppl/doi:10.1681/ASN.2015121367/-/DCSupplemental.